Japan’s constitution, established in May of 1947, clearly states that citizens have the right to health, and that the advancement and promotion of social welfare, social security, and public health are within the scope of government responsibilities [i]. In 1961, as a result of government-led social welfare measures, Japan achieved universal health coverage (UHC). Enrollment in public health insurance is compulsory, regardless of citizenship, for all those who have resided in Japan for three months or more. Rather than being freely selected by enrollees, public health insurance schemes are designated according to employment status, age, and residence. If an enrollee is neither the head of household nor eligible through his or her own employer, then the scheme is designated based on the head of household’s employment status, age, and residence. Regardless of the health insurance scheme in which residents of Japan are enrolled, they are free to choose their own healthcare providers as well as their frequency of treatment. In Japan, this system is referred to as a “Free Access System,” and according to Free Access, as long as residents hold proof of insurance, they may receive necessary medical services when sick or injured for a fixed contribution rate. Patients are free to receive care from the provider of their choice. For example, a man working at a company in Tokyo can make an outpatient visit to a specialist at a university hospital near his office during his spare time and later that same weekend be seen by a physician at a clinic near his home in Kanagawa Prefecture. According to guidelines, referral letters are required for outpatient visits at large hospitals; however, in most cases, patients are free to see specialists at large hospitals as long as they are willing to pay additional fees of a few thousand yen. Physicians also have freedom of practice. Moreover, if physicians have acquired medical licenses, they may exercise freedom by practicing in any specialties regardless of whether or not they hold specialized certifications. It is possible, for example, for a surgeon to practice as an “Internist/Orthopedic Surgeon,” and it is not uncommon to see signs outside clinics that list multiple specialties. As a result, out of convenience, some patients seek outpatient visits at secondary emergency medical facilities mainly intended for patients in need of hospitalization and surgery, despite having only minor illnesses, and such “visits of convenience” have been recognized as problematic. In order to safeguard the medical sector from exhaustion due to issues such as human resource shortages, primary care physicians and flat, per-visit copayments are being discussed as ways of helping patients to select appropriate occasions for treatment that are in line with the functions of each provider. Regardless of which of the three public health insurance schemes in which one is enrolled, benefit packages essentially remain the same. Enrollees are unable to select schemes themselves, so even though slight differences do exist between benefits, such as add-ons for disease prevention and health promotion, these differences do not influence enrollment. In all three schemes, benefits cover services such as hospitalization, outpatient visits, transportation costs for psychiatric treatments, prescription medications, home-visit nursing, and dental care. Co-insurance rates for medical costs remain the same across all insurance schemes, and are designated, instead, depending on age and employment status. Co-insurance for residents under 70 years of age is set at 30%. It is also set at 30% for those aged 75 and over but still earning incomes comparable to the current workforce. Co-insurance is set at 20% for children under 6 (prior to compulsory education), and it is also set at 20% for residents 70 to 74, while it is set at 10% for low-income earners aged 75 and over. In order to prevent catastrophic medical expenses from overburdening household finances, the High-Cost Medical Expense Benefit System subsidizes medical costs in excess of monthly, out-of-pocket (OOP) thresholds. These thresholds vary depending on the ages and incomes of beneficiaries. For example, in the case of an enrollee aged 69 years or under earning an approximate income of between 3.7 and 7.7 million yen, the monthly ceiling or maximum payment is calculated as [80,100 yen + (medical costs – 267,000 yen) x 1%]. The High-Cost Medical Expense Benefit System plays a major role in ensuring Financial Risk Protection (FRP) within the healthcare system. High-cost medical expense subsidies in FY2013 totaled around 1.6772 trillion yen for people under age 75 and totaled around 5.429 billion yen for people 75 and over. In the 10-year period from 2004 to 2013, those totals rose by factors of approximately 1.56 and 1.65 respectively. When viewed as a whole, total allowances for high-cost medical expenses are increasing. The methods for calculating insurance premiums vary depending on the public health insurance scheme, so premiums paid by enrollees also vary. In schemes such as those managed by Health Insurance Societies and the Japan Health Insurance Association (JHIA), employers are responsible for half the cost of premiums. Health Insurance Society and JHIA premiums are calculated by multiplying the premium contribution rate by the average amount of monthly remuneration (such as monthly pay, delimited at reasonable intervals, received by an insured person from an employer). Premium contribution rates vary from Health Insurance Society to Health Insurance Society and from one branch of the JHIA to another. The methods for calculating premiums within the National Health Insurance (NHI) system vary according to region. Premiums are determined based on four factors—income (levied on the head of household’s income), assets (levied on the head of household’s assets), equality (calculated per enrollee), and equity (calculated per household). In this way, premiums vary depending on the enrolled health insurance scheme, but in general, premiums rise in relation to income, since they are calculated based on factors such as income. Premiums cover not only the benefits of enrollees themselves, but also the benefits of those in the age 65 to 74 bracket as well as the 75 and over bracket. Consequently, because there are gaps in the income levels of enrollees among health insurance schemes, fiscal adjustments are undertaken among schemes to stabilize financial resources. Japan’s over 3,000 insurers can roughly be divided based on the three types of insurance that they provide—employer-based health insurance, residence-based National Health Insurance (NHI), and health insurance for people aged 75 and over. Health insurance for people 75 and over is primarily supported by public funding as well as by contributions from employer-based health insurance and NHI. Employer-based health insurance can be subdivided into 3 schemes. The first of these schemes is managed by Health Insurance Societies, aimed mainly at large companies, provided by over 1,300 insurers, and eligible for public subsidies in the case of financial difficulties. The second scheme is managed by Mutual Aid Associations (MAAs), aimed at government workers, and ineligible for public subsidies. The third scheme is administered by the Japan Health Insurance Association (JHIA) and aimed at employees of small- to medium-sized companies. Besides enrollee premiums, the majority of the JHIA’s financial resources are comprised of Health Insurance Society premiums and public funding. Aspects such as the number of enrollees and standard premiums vary by scheme. Health Insurance Societies were established as public corporations under the National Health Insurance Act. Societies are organized by single companies (Single Health Insurance Societies) as well as by business owners within the same industry (General Health Insurance Societies). Enrollees in Health Insurance Society plans numbered 29.17 million at the end of August, 2016, and there were 1,357 associations as of April 1, 2017. The JHIA was established based on the National Health Insurance Act as an insurer for the employees and families of small- to medium-sized businesses that are unable to establish Health Insurance Societies. Enrollees in JHIA plans numbered 37.18 million at the end of August 2016. Premium levels vary among regional branch offices. In cases where a Health Insurance Society becomes unable to operate and disbands due to reasons such as financial difficulties, beneficiaries thus far enrolled in the society-managed plan are then enroll in a JHIA association-managed plan. In other words, the JHIA assumes the role of a safety net for employer-based health insurance. Mutual Aid Associations were established based on Mutual Aid Laws as insurers for national government workers. At the end of March, 2014, there were eighty-five MAAs, and enrollees numbered 8.91 million. Similar to Health Insurance Societies, premium levels vary depending on the MAA in which one is enrolled. The residence-based National Health Insurance (NHI) system is the health insurance scheme that covers the self-employed, unemployed, and retirees under 75 years of age. In other words, the NHI acts as the medical safety net for sustaining the health of residents in the sense that it insures those not otherwise enrolled in insurance schemes. Management of the NHI was shifted from the national to the prefectural level in 2018, and the system is currently administered at the municipal level. The stated goal of this shift was to strengthen the financial foundations of the NHI, which continues to run a deficit, by placing fiscal management responsibility in the hands of prefectural governments, thus securing stable fiscal management and efficient business operations. Under the current system, NHI enrollees pay premiums, but 50% of the actual costs for benefits are covered by public funding. The system is financially unstable and faces structural challenges, including a high average enrollee age composition, low average enrollee income levels, and low average enrollee payment rates (both premiums and taxes). The Medical Care System for the Advanced Elderly, as mentioned in Section 1, was introduced in 2008. All people aged 75 and over are obliged to enroll, and all enrollees become insured individuals, with no distinction between supporters and dependents. The system is administered at municipal as well as prefectural levels. To promote transparency and accountability regarding the expenses and medical costs that accompany the aging of the population, the system for people 75 and over has been made virtually independent from the NHI system. Premiums are calculated at the prefectural level based on health expenditures from the previous two years and are deducted from the individual pensions of enrollees. Since premium payments from enrollees themselves only cover around 10% of medical costs, the Medical Care System for the Advanced Elderly is supported by public subsidies along with fiscal adjustments from the two aforementioned insurance schemes. As shown in Figure 3-1-1, a process of fiscal adjustments takes place among insurers. Contributions for people aged 75 and over, payments for people ages 65 to 74, and contributions to retirement funds are designated as expenditures of the Japan Health Insurance Association (JHIA), Health Insurance Societies, and Mutual Aid Associations (MAAs). These expenditures are subsidies for people aged 75 and over from within the income of the Medical Care System for the Advanced Elderly, subsidies for people ages 65 to 74 from within the income of the residence-based NHI, and retirement premiums. As Figure 3-1-1 also shows, the ratio of income (comprised of insurance premiums and state liability funds) to expenditures (comprised of insurance benefit payments) varies among insurers. As can also be seen, the portion of income within the Medical Care System for the Advanced Elderly and the National Health Insurance (NHI) system that is covered by the National Treasury greatly exceeds the portion covered by insurance premiums. In other words, the fiscal management situation is so severe that no other choice remains but to rely on the National Treasury. 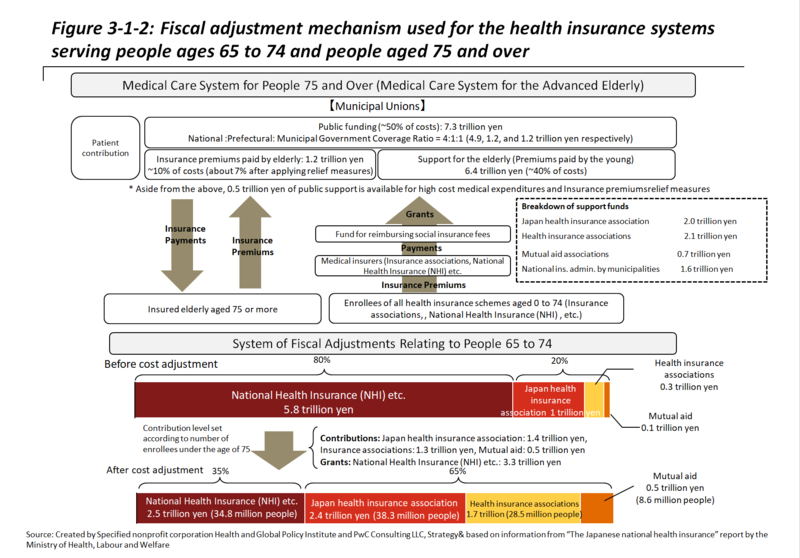 In terms of fiscal adjustments within the medical care system for the elderly, as shown in Figure 3-1-2, about 50% of the financial resources for the Medical Care System for the Advanced Elderly (75 and over) are covered by public funding (National : Prefectural : Municipal = 4:1:1), 40% are covered by contributions from individual insurers (i.e. paid from the premiums of the working class), and around 10% are covered from premiums paid by enrollees themselves. The scale of medical expenses for those aged 75 and over has reached 16.8 trillion yen (FY2017 base benefit expenses of 15.4 trillion yen combined with out-of-pocket (OOP) patient expenses of 1.3 trillion yen). In principle, contributions paid out of the premiums from the labor force are determined proportionally according to each insurer’s number of enrollees aged zero to 74. Since this per-capita contribution depends on the number of enrollees, insurers with weak financial standing shoulder a heavy burden. Therefore, in order to burden each insurer based on their financial capacity, the apportionment of the required contribution from each insurer has been gradually adjusted, with the proportion of the contribution required from employer-based insurers starting at one-half of what they should owe in FY2015, then rising to two thirds in FY2016, and eventually to the total amount in FY2017. To resolve imbalances among the fiscal burdens shouldered by insurers that result from the unequal distribution of enrollees ages 65 to 74, each insurer’s burden is fiscally adjusted based on the proportion of the population ages 65 to 74 that they enroll. As a result of these fiscal adjustments, unlike in the Medical Care System for the Advanced Elderly, people ages 65 to 74 remain insured under the same various schemes in which they were previously enrolled. 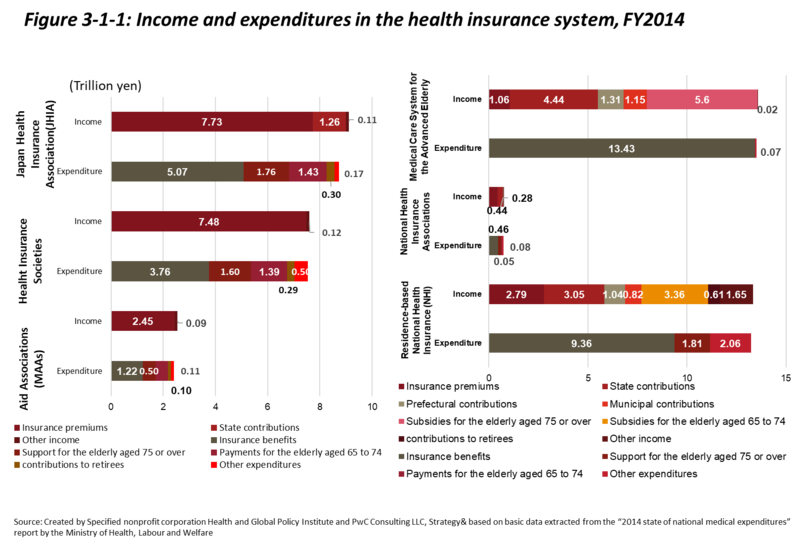 As shown in Figure 3-1-2, prior to fiscal adjustment, the benefit payments for those ages 65 to 74 are initially shouldered 80% by schemes such as residence-based National Health Insurance (NHI) and 20% by the other insurers, but this imbalance is fiscally adjusted among insurers such that in the end, benefits are shouldered 35% by schemes such as residence-based NHI, and 65% by the other insurers. As previously mentioned, under Japan’s system of Universal Health Coverage (UHC), citizens are enrolled in at least one of the public health insurance schemes. The following section explains Japan’s system of insurance-applicable services as well as the payment system for incurred medical expenses. The premise of this payment system is a medical service fee scheme. Medical service fees are the fees received by insured healthcare providers as compensation for publicly insured medical services and pharmaceuticals. After a patient visits a provider and pays the co-insurance portion of the incurred medical expenses (the total medical service fee), the provider then requests the remaining portion of the medical service fee from the insurer. As also described in detail in Section 7, medical service fees are set based on discussions held by the Ministry of Health, Labour and Welfare at the Central Social Insurance Medical Council, and a fee review is conducted once every 2 years. Medical service fees are scored using a system of points, with one point valued at 10 yen. 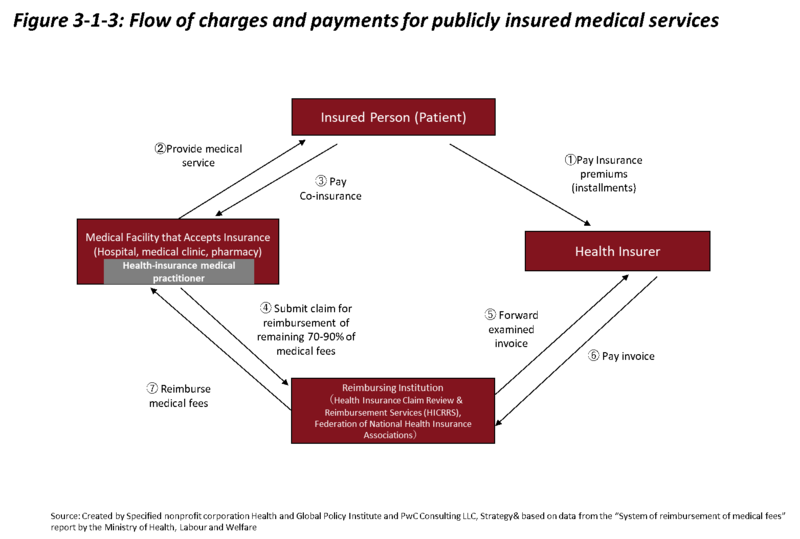 Figure 3-1-3 shows the flow of charges and payments for medical services covered by public insurance. When a patient carrying proof of insurance visits a medical provider, they pay co-insurance of 10% to 30% to the provider for received treatments based on their age and income. The 70% to 90% of the incurred medical fees that are excluded from co-insurance are covered by public funding from sources such as paid insurance premiums and taxes. Providers covered under the health insurance system submit claims for reimbursement of this 70% to 90% to Claims Review and Reimbursement Organizations (CRROs) such as the Health Insurance Claims Review & Reimbursement Services (HICRRS) and the National Federation of Health Insurance Societies (Kenporen). CRROs review whether insurance claims are reasonable, charge insurers for the remaining portion of medical service fees to be paid to the provider, receive these payments from health insurers, and pay them as reimbursement to providers. In other words, the role of CRROs is to review medical service fee statements (detailed insurance claim receipts) submitted by medical providers and process medical service fee payments based on the results of those reviews. ＜Column＞Insurer functions are entrusted to Claims Review and Reimbursement Organizations? Claims Review and Reimbursement Organizations (CRROs) established in each prefecture are in charge of sending invoices to insurers and receiving reimbursement for providers. Under this system, after a service is provided and co-insurance is received from the patient, the provider requests reimbursement from the insurer for the remaining portion of the medical service fee. In order to facilitate payment of medical service fees, the Health Insurance Claims Review & Reimbursement Services (HICRRS) and the National Federation of Health Insurance Societies (Kenporen) have established prefectural branches that handle the processing of medical service fee payments. CRROs confirm whether or not services provided to patients conform to insurance rules (E.g. Rules for Professionals in Charge of Insurance-Covered Healthcare Services and related notices). One issue that has been raised is that although all claims must be reviewed according to the same set of rules, reimbursement disparities remain among prefectural branches of CRROs because criteria for determining the validity of claims often vary by branch. National Federation of Health Insurance Societies “Healthcare Coverage Seen Through Charts, 2017 Edition,” Gyosei Corporation, p.57-59.